Lately I've been revisiting what St. Ignatius referred to as consolations and desolations. Thinking about and identifying occurrences of each over the course of a day is suggested as a spiritual practice to help a person understand how God is moving in his or her life. Some instruction I've heard on this practice, however, makes it seem like nothing more than taking a minute at the end of a day to write down what made you feel good and what made you feel bad, as if God has the same work in you as would an overindulgent grandparent whose only goal was to make you happy. It always helps to go to the source. Here's what Ignatius wrote about distinguishing the two "movements which are caused in the soul." "I call consolation every increase of hope, faith and charity [love], and all interior joy which calls and attracts to heavenly things and to the salvation of one's soul, quieting it and giving it peace in its Creator and Lord." "I call desolation all the contrary of the [above], such as darkness of soul, disturbance in it, movement to things low and earthly, the unquiet of different agitations and temptations, moving to want of confidence, without hope, without love, when one finds oneself all lazy, tepid, sad, and as if separated from his Creator and Lord." Hope, faith, and love–oh, and interior joy. Yes, please; more of those. 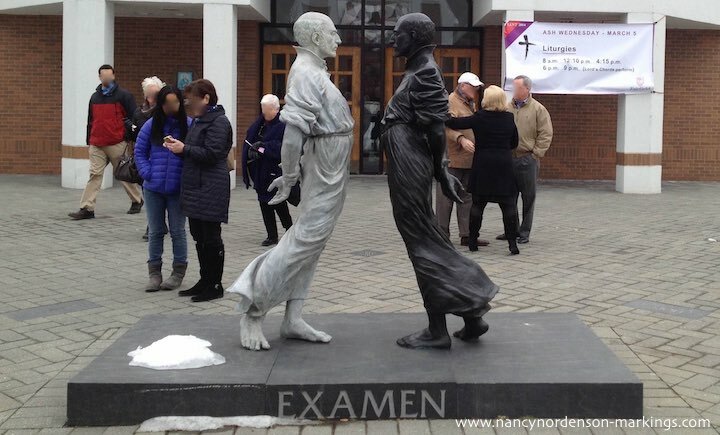 [Photo: taken several years ago of a statue depicting St. Loyola's "Examen" at Fairfield University in Fairfield, Connecticut (sculptors: Jeremy Leichman and Joan Benefiel).